We are open 12pm-9pm everyday. Looking to beat the heat with a delicious frozen treat? 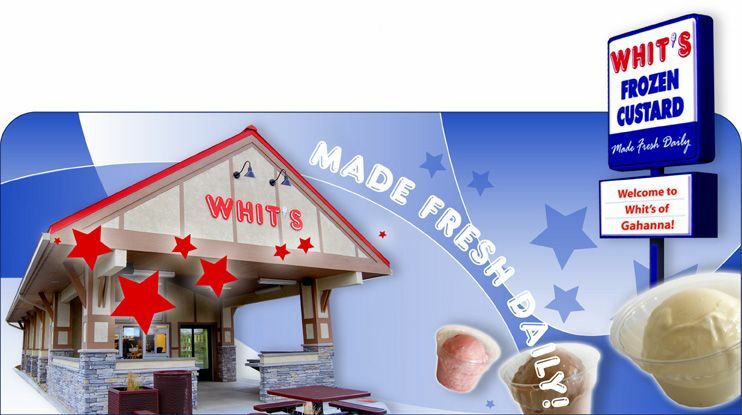 Join us today at Whit’s Frozen Custard to try one of our fresh-made flavors! Made right here in Gahanna, our shop crafts vanilla and chocolate frozen custard each day along with two specialty flavors of the week. Or you can create your own fabulous flavor combinations made with our fresh custard and a wide variety of candies, fruits, nuts and syrups to tickle your taste buds. The possibilities are endless! We also carry over 30 flavors in “hand packed” quarts as well as Whitties (cookie sandwiches), chocolate covered bananas and a selection of other treats which can all be found in our walk up patio freezer. Frozen custard is a super premium grade of ice cream dessert. It was developed by the French over 100 years ago and is often called "French Vanilla" ice cream. The great taste of frozen custard is attributed to the high quality dairy ingredients, 10% butterfat, a small amount of pasteurized eggs and the blending of very little air during production which creates a smooth and creamy texture with a rich flavor. Once you try Whit's Frozen Custard, the excellent taste will bring you back for more. In addition to delicious desserts our shop also features a selection of hot and cold sandwiches and wraps for a fast and tasty meal. Call (614) 418-9599 for catering or stop in from March to December to enjoy our fresh and flavorful frozen custard! We are located at 121 S Stygler Rd, Gahanna, OH. Get your Whit's about you and stop in today!